Getting the composition in your photos is something that's very important. I don't know if you've noticed, but you'll see that my subjects are almost never centered in the photographs and this has been done on purpose. Dead center in a photograph is basically death to your photograph for the most part. It's boring and our eyes don't like to see it. There are exceptions to the rules, but for the most part our eyes are drawn to certain areas within the photograph and we're going to talk about that right now. The most referred to rule is the rule of thirds, and that's why I have these lines placed into this photo. We have carved it into thirds, not exactly but close enough, we carve it into thirds both horizontally – there's the top, middle, and bottom third – and also vertically – there's our left, center, and right areas. Where these lines meet, these are areas of convergence. The areas of convergence are where the eye of the viewer naturally tends to go. If you want your viewer to look at your photo you need to arrange the elements of your photo within those areas as close as possible. Not exactly, but as close as possible to make it interesting. There are exceptions to that. Where you might want to show symmetry or something like that, but generally speaking, you'll want to put your subjects in one of the areas of convergence. So again look at this – we have a picture of this little girl against a yellow wall, and she has a yellow skirt on, and there's some yellow in the flowers on her shirt, it's all complimentary. But, if we look at the composition, you'll see I've got her head near that area of convergence and actually her eye-line is dead on in that area of convergence. Her body is also in the left vertical third, which just makes this a very strongly composed photo that you would want to look at. And that's the goal of every photographer, to have people look at their photo for as long as possible. To enjoy it, to convey a message, anything like that. 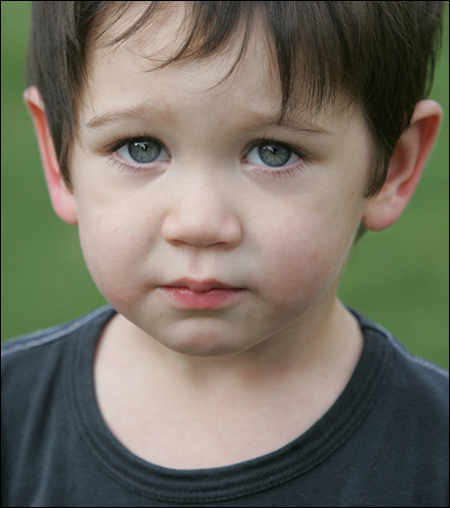 Here's another one of a little boy. I haven't put the lines in, but let's look at the composition. If you carved those lines in both vertically and horizontally, you would notice that his eyes fall in the convergence of both the upper left and upper right areas of those thirds. And because of that, you have to look at those eyes. You have this cute little boy, he's got this little pouty look on his face, but as a photographer I did that on purpose to draw the viewer's eyes to his eyes. Notice how I chopped off the top of his head; we're going to talk about that in a bit, but you don't always have to show the whole entire body. You emphasize those things that you want to emphasize as a photographer, as the artist. Don't forget that; you're in control. 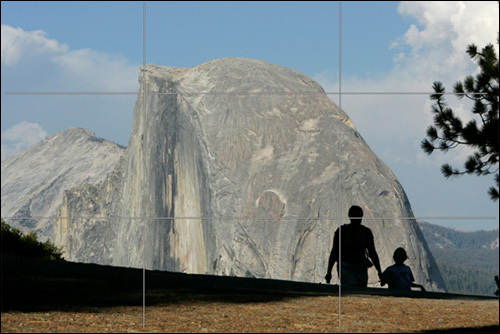 Now there are also some composition rules for landscape photography. Some people just love to photograph landscapes, and this is a shot of Half Dome in Yosemite taken from Glacier Point which is across the valley... one of the most beautiful places on earth. For landscape photography, you don't carve it into equal thirds, you take the horizon and put it in a third spot, either one third or two thirds. Showing more of whatever you want to emphasize. Here I'm emphasizing the land. So I've got two-thirds of the land showing, with only one-third of the sky. It's most important that you put the horizon on that line. These composition rules are huge. 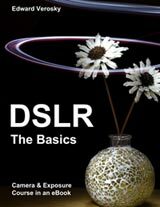 If you can get those two basic concepts down, your photography will grow by leaps and bounds. This landscape rule also equates to buildings. You can think of buildings as landscapes, trees as landscapes, so you put two-thirds/one-third. One-third sky, two-thirds grounds, and it doesn't have to be just thirds, it just needs to get away from half and 40 percent. If you really want to emphasize the sky or the ground do seven-eighths sky or seven-eighths ground. 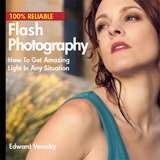 The sky is the limit, no pun intended there, to make your photography better. 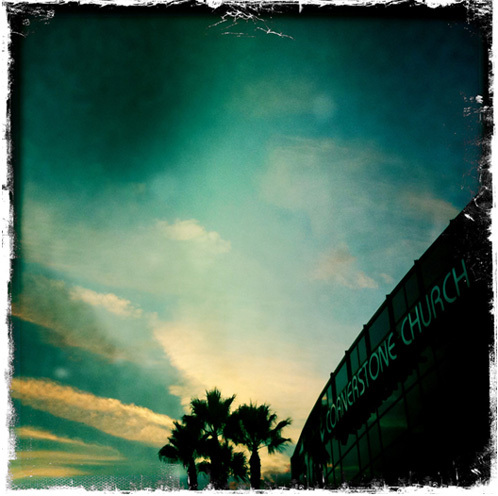 For example, I placed the building and palm trees in the lower third of this image to emphasize the sky and the clouds. 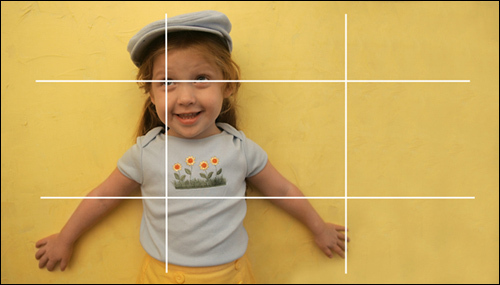 Apply this compositional rule to make more effective images.